I've misled you perhaps. I had dinner with this guy and a table of filmmakers and Brad and Allie. BUT STILL. I seem to remember a slight breeze tossing my hair while he smiled, our eyes locking as we discussed the glazed porkchops. Sure we shared the table with 5 others, but as far as emotional connections and immediate attraction, it was just he and I. Maybe. Allie and I attended a premiere at a little festival we locals like to call Sundance. What's that? Biggest event of the year? Couldn't get tickets? Missed your chance to see the back of Paris Hilton's head walk into a club? That's really sad for you. I, however, am blessed with a rather rad roommate (not any more, but I'm a sucker for alliteration), who happened to have an extra ticket to (500) Days of Summer, staring, yes, believe it, Joseph Gordon-Levitt (pictured above). And don't worry, it being a premiere and all, he was there. Serendipitous, I thought. And my how far we had both come. He, coming from a sitcom career to a full fledged movie star, and my hair having grown at least three inches. Knowing that fate had brought us together once more, I understood my reponsibility. I was to reestablish that connection. With nothing but the Devil's advocation from my "friend" Allie, I prepared to speak once more to the man who was undoubtedly my one true love, and with whom I was to live a charming and passionate life somewhere in a French countryside, where the paparazzi would never find us. "He's coming," whipsered Allie. As I turned I stood face to face with the dream. I reached out, brushed his shoulder, and with an expectant smile said "Hey, we had dinner together." Confused smile. Blushing. "Good movie. You did a good job. I liked it." Still confused. "Thanks". Turn. Walk away. Allie told me about that. Funny. And smooth. Very smooth. Somewhere he is with his assistant, barking orders to find that girl from the premiere. "I don't care what it take, find her...!!! This glass slipper will not go to waste"
There is no comment more clever to leave. I won't even attempt. Thank you Brad. came to your blog through emily mcbride's via quinn garner's. 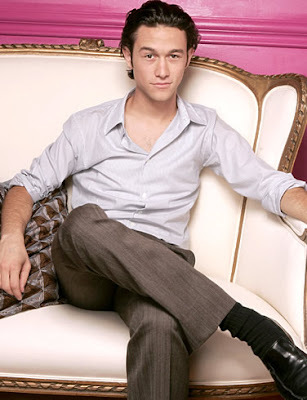 i love joseph gordon-levitt so much more than zooey deschanel.